Well, the year is ending in a few days. 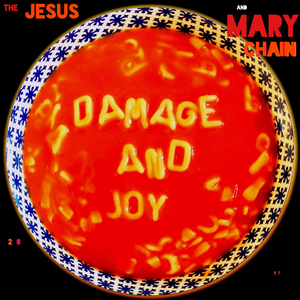 I wanted to get this final album review out for the new Jesus and Mary Chain album, Damage and Joy. I saw the band when I was in New York in November, and I bought the album sort of on an obligatory whim. I really didn't like one of their later albums, Honey's Dead, so I have been cautious about the JMC's output for a while. This broke my expectations for sure. The album cover is pretty cool. I like the saturated look and the playfulness of it. The text has a fresh, erratic feel to it. Since this is a comeback album, and one that seems exceptionally honest for the majority of it, I like that it blatently displays the year on the front. Originally I felt like this cover was lazy, but it made sense after listening to the musick. "Amputation" starts the album off with a driving, full sound. It's sets the tone for the rest of the album with a clear production, thumpy drums, powerful bass, and the expected noisy guitars. There might even be some electronics here making feedback sounds in the background. The lyrics are downbeat but hopeful. It's a comeback of survivors. The next track, "War on Peace", is a slow and dark refutation of the solemnity of old age. Despite this, the song has a classic sound akin to 60s garage-rock and girl groups and other things that inspired Psychocandy. I love the fast outro and noise. "All Things Pass" sounds like it's about the aftermath of living fast and hard, having found yrself after looking for so long. It's a simple song, and the latter half is pretty cool. It is a bit repetitive. "Always Sad" goes back to the old school rock 'n' roll sound. It's a duet, and that works well. I like the guitar parts a lot. There's a kind of star-crossed lovers thing here. It's a familiar feeling. "Song for a Secret" continues where "Always Sad" left off. It's another duet, and it's a love song between survivors. It's confident with bright bells and upbeat, ringing guitars. The vocals on "The Two of Us" sound like Joey Ramone. It's another love duet and again bolstered by maturity. The chorus is sickeningly sweet, but I like it. The next track, "Los Feliz (Blues and Greens)" is a pretty dark one with very bright chiming guitars and breathy vox. It sounds like a criticism of American exceptionalism and the violence that results from ennui. The chorus is super forceful, punchy, and hits hard. This is one of my favorite tracks. "Mood Rider" sounds like a drug trip or the kind of thoughts you have at 3AM falling apart in strands of various shades, courage and cowardice in the face of the unknown. I really like this one too. "Presidici (Et Chapaquiditch)" is a cool song that makes sense to me, though I couldn't really tell you what it's about. The lyrics are amazing: "and the son of Allah, he was a hell of a guy, hippie of God and famous liberal guy". "Get on Home" is an old blues song that isn't old, but maybe Howlin' Wolf would have written it if he was alive today. Nearing towards the end, "Facing Up to the Facts" is kind of weird, but it's another one about coming to terms with the real world. The lyrics are funny and dark, though they also make me think a bit. "Don't worry be happy". Yes and no at the same time, right? The next track, "Simian Split" has a kind of free jazz intro and then this amazing verse - "I killed Kurt Cobain. I put the shot right through his brain. And his wife gave me the job, 'cause I'm a big, fat, lying slob." I didn't like "Black and Blues", the penultimate track, too much at first. It works as the song goes along. I do like the guitar when it goes out into some space orbits. It's definitely not one of my favorites though. I think it's the weakest track on the album. "Can't Stop the Rock" is a good end. It's back to the love song duet thing, and it's kind of an obvious song, if that makes sense, which I think it sort of why the Jesus and Mary Chain work as a band. Damage and Joy was much more than I expected it to be. I didn't know anything about it when I went to see the band, and, while they were awesome live, I did not know if the record would be of the same quality. I was expecting "Reverence" from Honey's Dead, but I got something that summed up their output as a whole, something that combined the bleakness of Darklands with the neo-garage of Psychocandy and the best of their later records. Damage and Joy also is more than just a cool album to me; it made me feel better about myself and about the year that is coming up. I've been suffering from depression, a lack of order, and a disconnect from others. I listened to the album right after I got back from New York and intended to write this review a few weeks ago, but I couldn't get myself together. It seemed like such a task, this being an actual record by a band that a lot of people know. After listening to it again to write this review, I feel much better. Not everything can do that. Damage and Joy gets a Good.